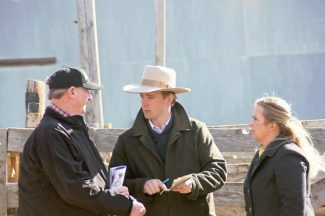 Dave Nisley, Broadus, Montana, visiting with sale hosts, Bryce and Meghan Foos at the Foos Angus sale. Travis Hurst, Buffalo, South Dakota, repeat Foos Angus bull buyer. 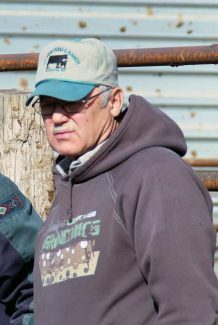 Neil Wagner, Andover, South Dakota, purchased Foos Angus bulls. A big crowd of mostly repeat buyers gathered at Belle Fourche for the annual production sale for Foos Angus, owned by Bryce and Meghan Foos and Renee' Foos. The Foos Ranch is located in the Nisland area, northeast of Belle Fourche. Bryce and his family are well-liked in the community and by their customers. The Foos family has one of the best guarantees in the business. Key principles for the Foos herd are fertility, maternal traits, and efficient conversion of grass to pounds. A cow herd that consistently produces offspring, and breeds back, is most important to any operation, and they have a very maternally-bred cow herd. The bulls are presented with a modest amount of flesh, as these bulls are purposely fed lightly to ensure longevity with good feet and legs. These bulls last into maturity. There was especially good interest on the top end of the calving ease bulls. The top-selling bull of the day was Lot 3, selling for $9,750 to Troy and Vicki Tope of Hulett, Wyoming. Sired by CAR Chinnook 786, he was out of a daughter of BF 348 Alliance 159-5. He was 90 pounds at birth and weaned at 655 pounds. His EPDs were BW 1.4 WW 51 YW 83 MILK 28. Lot 17 sold to David Donahey of Capital, Montana, at $9,500. This calving ease bull began his life at 67 pounds, and then weaned at 661 pounds. He was a son of Foos Complete 360, and out of a daughter of Foos Right Time 135. His EPDs were BW -2.9, WW 40, YW 67, and MILK 23. Another purchase by Troy and Vicki Tope was Lot 14. This bull was pictured in the catalog, a son of Foos Complete 360. His mother was out of Foos Windy 916, and he was 81 pounds at birth. He weaned at 717 pounds, and posted EPDs of BW 0.3, WW 45, YW 74, and MILK 24. He sold for $8,000. EB Ranch of Broadus, Montana, continues to be a longtime customer of Foos genetics. Their purchase was Lot 15 at $8,000. Another son of Foos Complete 360, he was out of a daughter of PRE Hero 914. Born at 79 pounds, he weaned at 657 pounds. This calving ease bull had EPDs of BW -0.9, WW 40, YW 70, and MILK 27. 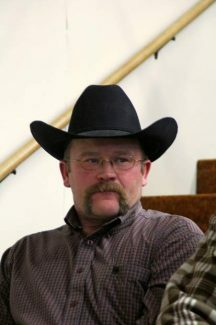 Randy Arpan came from Alzada, Montana, to own a Foos bull at $8,000. His purchase was Lot 18, another calving ease son of Foos Complete 360. His mother was a daughter of Foos Right Time 135, and he entered this world at 80 pounds. His stats included EPDs of BW-1.0, WW 39, YW 64, and MILK 23. The people enjoyed the coffee and pie served at the Belle Fourche Livestock Café and sponsored by Foos Angus. Stop by the Foos Angus Ranch at any time to inspect the cow herd and upcoming Angus bull calves. Their ranch is right on US Highway 212, only one mile west of Nisland.